The letter comes in from the American Kennel Club approving you as a new Obedience and/or Rally Judge. Congratulations! You have met all the qualifications, read the Obedience/Rally Regulations, taken the test(s), had a ringside interview, and now all you are waiting for that first invitation to come your way. Have you given any thought to how you will respond and what questions to ask when that phone call or email happens? OMG, this is not covered in the Regulations, BUT there are some suggestions for guidance in the Obedience Guidelines. Written Invitations Only. Require all clubs to send you written invitations for assignments. Their requests should clearly specify the class(es) you are being asked to judge. Promptly acknowledge all invitations, again in writing, and keep accurate records of assignments you accept. Avoid Conflicts. It’s your responsibility to acknowledge judging invitations promptly. 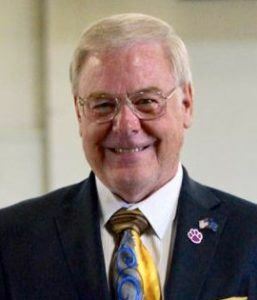 Careful record keeping and prompt acceptance (or refusal) of invitations helps eliminate unnecessary confusion and conflicts for both judges and trial giving clubs. A judge may accept assignments to judge the same classes for two obedience trials that fall on the same day at the same site. A judge may accept assignments to judge the same classes at two obedience trials over the course of a cluster of no more than five (5) consecutive days at the same site or within a local geographical area as determined by the AKC. A judge may accept an assignment within 30 days and 100 straight line miles of another assignment only on an emergency basis. An emergency basis is defined as an advertised judge notifying a club within 72 hours of an approved trial that they cannot fulfill their assignment. There are no such restrictions on non-regular classes. Assignments to judge the same class or classes at two different breed specialty or group obedience trials are not considered to be a conflict. Breed specialty obedience assignments or group shows are not in conflict with an assignment to judge the same class(es) at an all-breed obedience trial. Travel Between Assignments. Judges cannot do their best work if they are tired from travel. They should not accept assignments on succeeding days where more than a few hours’ travel by ground transportation is involved. Judges should understand that upon acceptance of an invitation, they are committing themselves to the trial-giving club for the entire day. Their travel plans should not be predicated on arriving late or on leaving early to get transportation home or to another show. Judges should not ask clubs or superintendents to arrange judging programs to accommodate their travel plans. Judges should not travel to or from trials or stay with anyone who is likely to be exhibiting or handling under them. Expenses. When you accept an invitation, clearly inform club officials what your expenses and fee, if any, will be, so they will not be surprised by a larger than anticipated bill on the day of the trial. This is a contract between you and the club. The more specific details you and the club include in the contract, the less the potential for misunderstanding. This is an important consideration and a courtesy to clubs. If you sign a contract provided by the club, you and the club are responsible for abiding by its conditions. There are regional differences in our sport so this may play a role in one’s responses, depending where one lives when contacted. Consider that location. Are there a plethora of shows and the opportunity to judge is abundant in your areas of the country, or are you “out in the sticks” with shows far and few? The answer may factor into judging fees (or not) and travel expenses to be charged, especially when starting out with only a Novice provisional approval. 1. When I first became a Novice Judge, I only charged for expenses (travel/tolls). I was also an approved rally judge at the time, so if I was given a Novice and/or Beginner Novice judging assignment along with Rally, I would also not charge for Rally. As I progressed through the levels, I would only charge if asked to judge a level where I was fully approved, not provisional. 2. If a club is small or generally has very limited entries (say a specialty club), I will work with them and not charge a flat fee. I may instead tell them that I will charge a fee per entry (say $3.00 per dog). 3. Daily fee (with surcharge if "2 trials in 1 day"), lodging, meals during the weekend and in route if driving, IRS mileage rates at time of travel round trip, I give the Google Maps distance. If plane travel: IRS mileage to/from airport, parking per day, Airfare and, if I remember, I ask whether the club will reimburse plane tickets in advance of the trial. Tolls, parking, etc., transport to/from airport to hotel, if any. 4. I state my basic rate. If I decide to give a club a break, or a donation, etc. it's up to me. 5. I have a fee to judge one type of competition one time a day. If I am to judge the same type of competition (two trials in a day) or two kinds of competition (obedience and rally) I add $25.00 to cover the extra preparation costs. I give single breed specialties a small discount. 6. I would first ask a judge if they were willing to give up part of their weekend assignment. Perhaps give up Novice B and Beginner Novice or Open A and Preferred Open, for example. They almost always said yes. They were helping out a new judge and reducing their work load; nothing to lose really. Once I received the judge's okay I would contact the club, explain that this judge was willing to give up said classes and that I was willing to take those classes at no expense to the club. The club also had nothing to lose and was helping a new judge as well. This method worked great and I really flew from Novice through Utility. In any event, this proactive approach can literally take years off the process. 7. When I was in Novice, I did not charge a fee at all unless I was also doing Rally (for which I was fully approved). I did take expenses in terms of mileage and a hotel if needed. When I got to Open, I started to charge a modest fee and the customary expenses. I don't charge for any of the paperwork since I consider it to be a part of my fee. 8. Don’t feel guilty for charging a fee, ever. We have judges who cannot charge a fee (delegates), and there are a few judges who don't charge a fee, either because they don't need the money or they feel it's their way to give something back to the sport. But ultimately judging is a business, and it is one that carries a tremendous amount of responsibility. We go through a lengthy process in order to apply for each level, and a lot of work to be approved at each level. 9. If I'm a member of a club, no fee is charged, just out-of-pocket expenses. But that's up to the individual judge, unless the club has adopted a policy prohibiting members charging a fee. In this instance, the judge is hired in their professional capacity and not being paid to do club work. 10. Each judge has to decide for themselves if they are willing to accept these offers. Typically expenses include travel to and from the event, food and lodging. As for an invoice, judges make up their own as a word document. 1. Get a SIGNED, PAPER contract (or a contract to print, sign, scan and return.) I am dealing with one club right now that doesn't seem to "get it." I still don't have a contract though I sent those two signed copies of a paper contract, and a SASE...still nothing. 2. I confirm the date carefully and check carefully for conflicts. I confirm the assignment as it directs the fee. 1. to make sure it was okay with them. Club 2 sent paperwork into the AKC first. Then Club 1 contacted me to say AKC wouldn't approve me as there was a conflict. When I checked, I noticed that Club 1 had changed the classes I was to judge (different from contract, that's why there was a conflict.) I forwarded a copy of our email discussion noting classes for each club back to Club 1, which really kept me out of hot water. Yes, sometimes they change the classes from what was agreed upon in the contract. That I had checked with Club 1 before accepting Club 2. and kept that communication, saved me. 4. Contracts are between the Judge and the club. 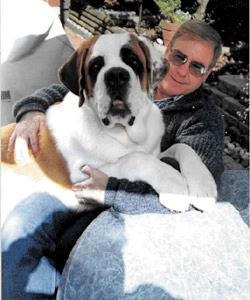 AKC does not get involved in contract negotiations between judges and clubs. 5. Dates, location, transportation requirements (since sometimes you fly and need to rent a car), fee, what expenses are covered and if they have limits, who is/are my contacts. 1. Check in your area to see if there is a Judges Group/Association. I know of two on the west coast. Judges meet and discuss all sorts of issues. At these meetings they may discuss new rules and regulations, putting on AKC judges seminar (due every 3 years), what one needs in their briefcase/judges bag, fees, how to organize your calendar for future trials. One group even has workshops where all levels of judges do a mock trial. One Utility, one Open, and four Novice judges and this opportunity was treated like a real trial with the measuring of rings, equipment, steward instructions, etc. There are two mentor judges observing each judge. One would score alongside and the other would view positioning and procedural views. Then each judge would listen to the critiques by those mentors. Most members helped in some way to make it successful! 2. Don't take the last plane out the night before the show. If anything happens, you're sunk as far as trying to get there on time. Think of your health and sanity when trying to save the club a few dollars. I've always tried to fly out the last day of the show rather than charge for an extra night in a hotel, but am starting to re-think that, especially traveling coast to coast. It's also not good to drive home in the mountains at midnight or later after a long weekend of judging and travel. 3. If time permits after apprenticing, a perspective judge might query the judge on how they handle such issues in dealing with clubs and contracts. 4. Take your own “office” supplies. Not only will you know how to work them you can/ should be confident they will work. 5. People who work for their local clubs have better opportunities for assignments; get in there and help with every job. Follow through on your commitments to your club(s). Choose good mentors who can help answer questions along the way. Don’t take yourself too seriously, everyone makes mistakes sometimes. Make changes with your ring procedures if you find something isn’t working correctly. It is better to get in the habit of running your ring correctly to establish consistency. Have fun and your exhibitors will too! 2. Random Little Tidbit #18, Insights Into Judging Obedience. 3. Random Little Tidbit #19, Insights Into Judging Obedience. From the group exercises only if it has non-qualified in the individual exercises. Dog that must be repositioned in the group exercise. A dog must be released from the group exercises for displaying uncontrolled behavior, if it interferes with another dog or leaves the place where it was left during the first group exercise. If the dog has been released write “NQ-R” (Non-Qualifying Released) then carry down an “NQ” in the “Total Score” box. “NQ-R” does not require the judge to state a reason. 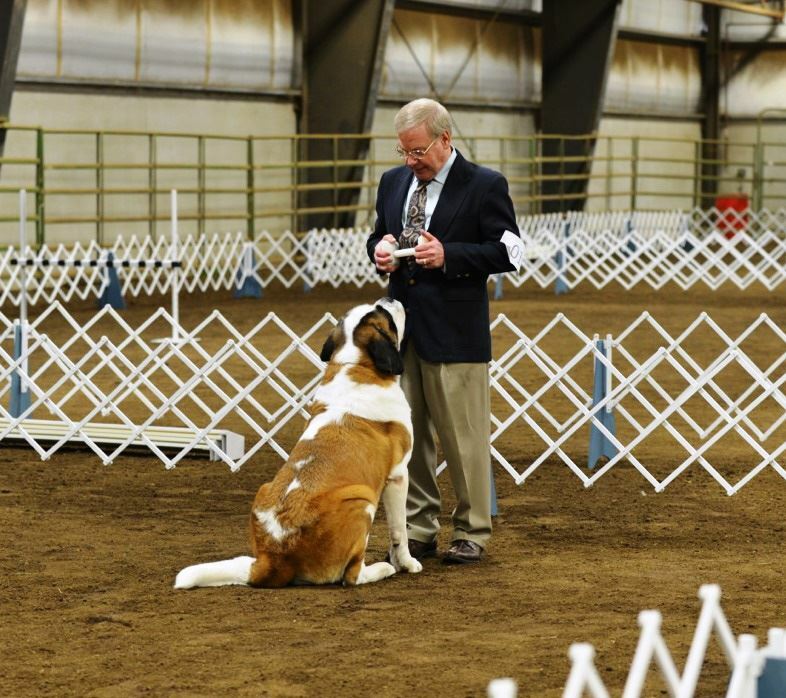 Dog relieves itself while in the ring for judging. Handler carries or offers food in the ring. Dog’s performance has not met the minimum requirements. A dog that is out of control. Any dog unfit to compete – sick. Any dog lame, bandaged or stitched. A dog that appears dangerous to other dogs (including when lining up for Groups). Handler who abuses their dog or who disciplines their dog in the ring. 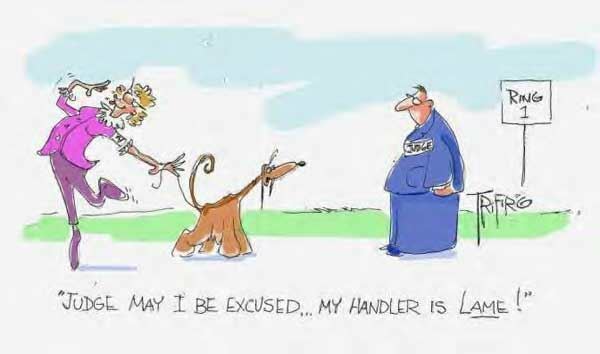 Handler who willfully interferes with another competitor or competitor’s dog. The Judging Procedure for the Judge’s Book for Excused dogs has not changed! All “Excused” dogs require the judge to state a reason in the judge’s book. DO NOT carry down an “NQ” to the Total Score box. 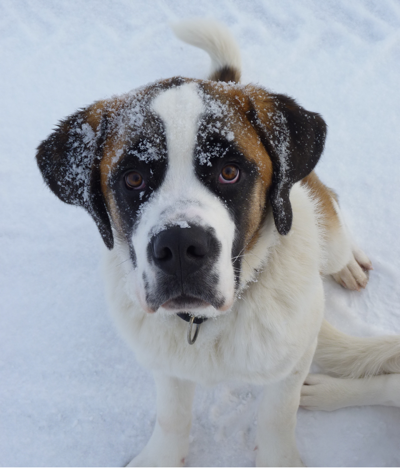 If a dog is “out of control”, it is to be EXCUSED; versus a dog that “demonstrates uncontrolled behavior”, that dog must be Released from returning to the Group Exercises. Likewise, any“misbehavior” that is disruptive enough to remove the dog from the ring, as long as that dog isnot considered dangerous would be “released”. For additional information regarding marking the judge’s book please see page 119 of the Obedience Judge’s Guidelines. I have noticed a little bit of confusion with the Regulation change where a dog may now be carried while in the ring. Yes, there was a change on December 1, 2015 in this regard, but there are stipulations when it may or may not take place. So, if you choose to pick up your dog and/or carry it into or out of the ring make sure when it is acceptable, otherwise a substantial deduction may be in order. And remember a substantial deduction is three (3) OR more points; that deduction alone may cost a placement in the final score standings! Let’s take a quick review of the new Regulations and the Chapter and Sections which pertain to the change in verbiage. Chapter 2, Section 11, Notification and Announcement of Scores. Chapter 2, Section 22, Praise. There you have it. When one is in the ring for the individual exercises (or Group exercises) they are being judged from the time they enter the ring until they pass through the exit on the way out. When one comes intothe ring for awards, they are not being judged---there lies the difference. To assist you in your apprenticing for becoming an obedience judge, observe how a Judge sets up and marks their ring for the different classes, plus judging position(s) during the various exercises. Take notes go over them with the Judge if time permits. 1) Size of the ring for the class(es) being judged for the day. 2) The marks put out in the ring when setting up for the different classes. 3) Placement of the judge’s table. 4) Ring gate as it relates to heeling pattern and the different exercises. 5) Placement of jumps and checking the equipment. 6) Heeling pattern(s)--Is your pattern fair to all breeds and handlers? Is it choppy? 7) Are the Fast, Slow and Halts adequate and fair to all breeds? 8) Positions and movements during the heeling pattern--observing the most possible! 9) Position during the different exercises- is a reason for where the Judge stands. 10) Calling of Judge’s orders--correct orders, timing the giving of the order. 11) Instructions to the stewards. 12) Posted materials at ringside. 13) Worksheets and charts to assist in making quick notes for scoring and feedback. a.) Group worksheet for scoring and notations for qualifiers and non-qualifiers. c.) Instructions to handlers and stewards. d.) Find out where the out of sight area well be BEFORE you start judging the class. 15) Note handler and dog errors between exercises that are scorable (also during Groups). 16) Checking the items the handler presents for the different classes and when to check. 17) Observing the dog and handler while in the ring at ALL times from entering to exiting. 18) Judge’s Book--filling out the Book, who to give it to and when to turn it in. 19) Announcements, Awards and presenting the placements to the audience. 20) What’s in the briefcase? “Tools of the trade” so you are prepared.